Fed up of misinformed old wives tales about sleeping with a pink ribbon under your pillow for girl, or determining that your energetic Kung-Fu foetus must be a boy owing to the amount of kicks and jabs your ribs receive on a daily basis? We don’t blame you. 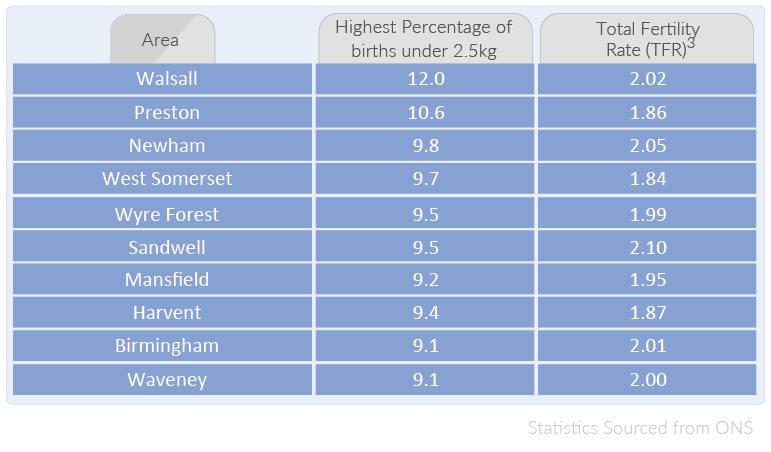 However, in a recent nationwide survey; conducted by the ONS, data was collected on the number of male and female births in each town and county. 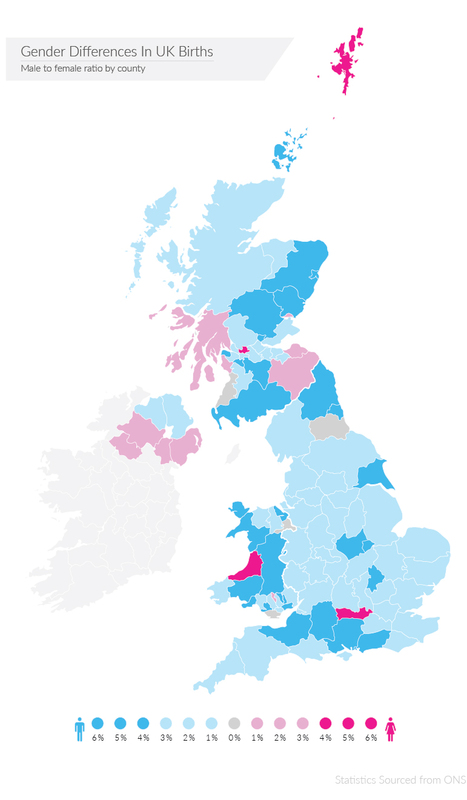 In conjunction with journalistic.org, we created gender-coded maps to reveal the likelihood people would have a boy or girl across the UK. The data was collected over the period of one year and took individual districts into consideration. 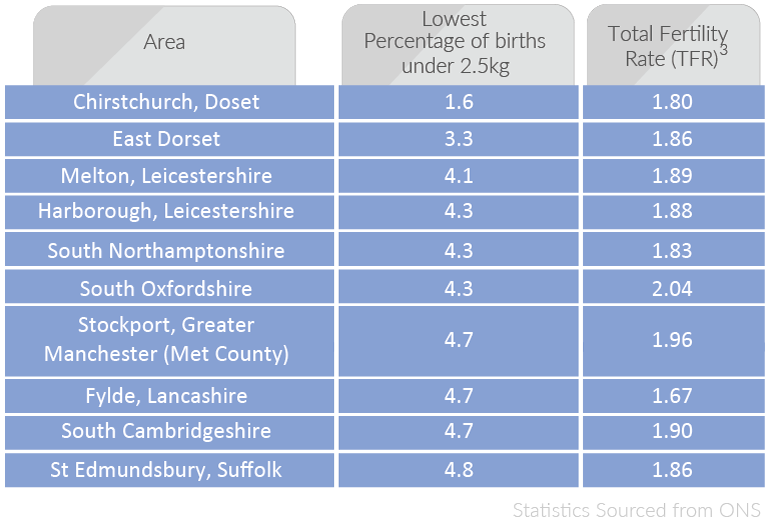 Considering that thousands of births were recorded at each maternity unit; the gender gap was very tight indeed, with just one birth swaying certain districts as being a ‘pink’ town or a ‘blue’ town. 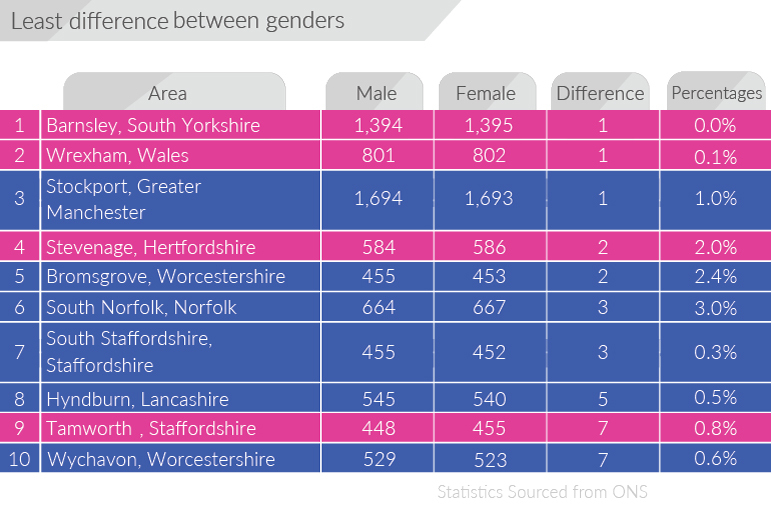 However, a few towns proved to offer a greater divergence between genders. Although the difference remains relatively small, the findings make for an interesting debate regarding whether the baby’s gender is solely determined by genetics, or whether certain genders prevailing over others would be indicative of other environmental and lifestyle factors. Map A (Interactive): This map uses a colour gradient which corresponds with the difference in gender percentages. It offers a technical representation of how likely you are to have a girl or boy across certain counties. Map B: This map uses an exaggerated colour gradient, which allows for a clearer (albeit simplified) representation as to how likely you are to have a girl or boy across certain counties. Map C: This map only considers whether the statistics are in favour of a girl or a boy, no matter how small the percentage difference is. It also notes the two areas which recorded the largest difference in male to female births. 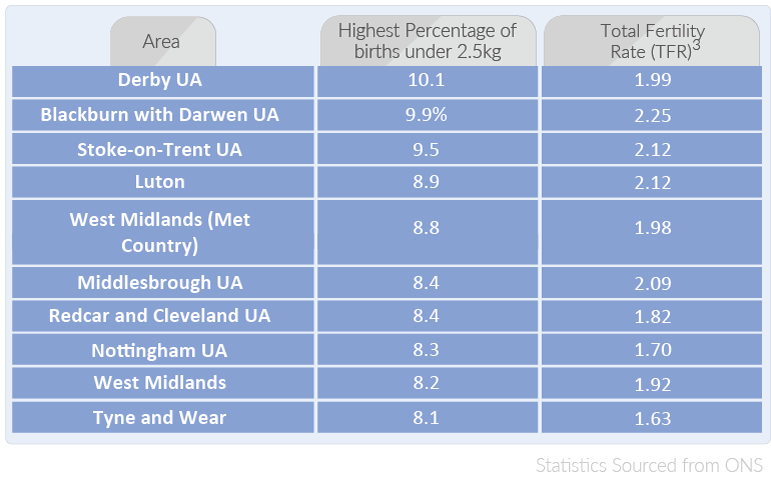 It is important to realise that even though it would appear that the vast majority of the UK see more male births; the difference may be minimal. However, the sheer quantity of areas that show a greater percentage of males born to females is nonetheless fascinating. This table offers a ‘zoomed out’ representation of the UK; looking at larger areas such as Scotland, Wales and the East. When analysing the gender trends of larger areas across the UK, it becomes apparent that male births outweigh female births in most larger areas. This table offers a ‘zoomed in’ representation of the UK; looking at smaller areas such as boroughs, cities, council areas and towns such as; Barnet, Newport and Glasgow City. 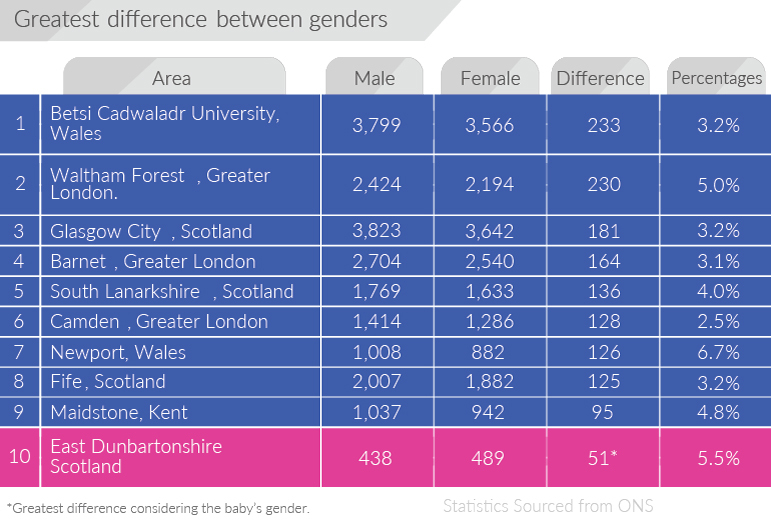 When analysing the gender trends of smaller areas across the UK, male births still outweigh female births in most areas however, there are a greater number of areas that can be identified as having more female births to males. This table offers a ‘zoomed out’ representation of the UK; looking at larger areas such as Poole, County Durham and Torbay. This table goes some way to affirm the popular belief that the chance of having a girl is roughly 50:50, with a slight weighting towards boys. 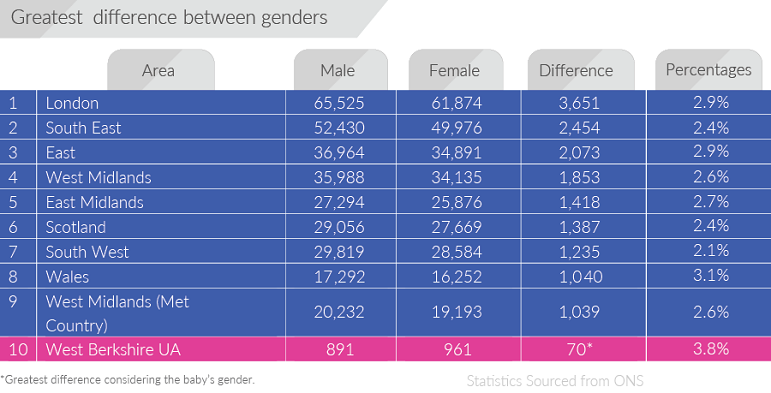 Unlike the exaggerated colour gradient used for maps B & C; this table displays how in the majority of areas, the difference in male to female births is negligible. 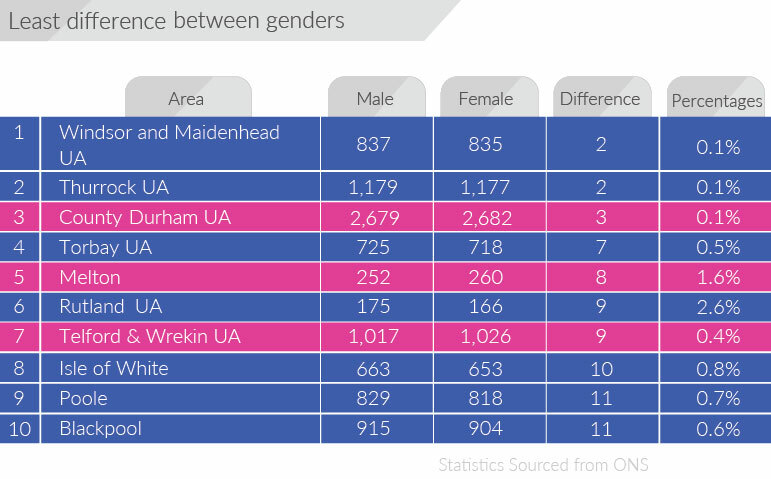 This table offers another ‘zoomed in’ representation of the UK; looking at smaller areas such as Tamworth, Wrexham and Barnsely. Again, the table affirms the popular belief that the chance of having a girl is roughly 50:50 with a slight weighting towards boys. The survey also tallied the number of babies found to be of a low birth weight, and tracked the fertility score of the areas surveyed. 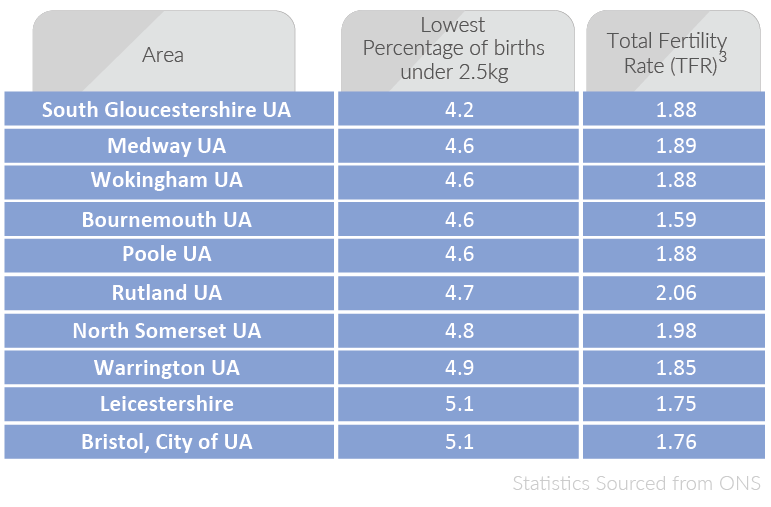 To determine whether there was any correlation between low birth weight and the fertility of the area, we examined both areas of study in turn, looking at the top ten cases at each end of the scale. What is a typical birth weight? 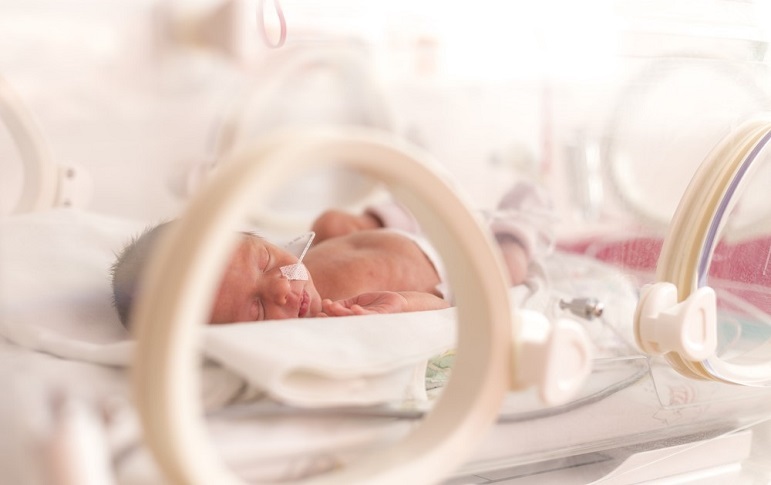 Infants born with a low birth weight may require additional support from neonatal staff due to potentially lowered immune systems and their bodies not having the full time desired to finish developing. 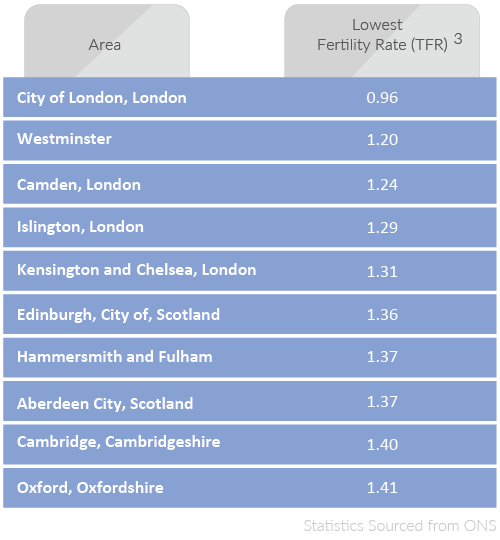 To assume that the difference in fertility rates between the aforementioned areas is in any way related to local pollutants (such as air quality from traffic, or industrial waste making its way into water systems) would be misinformed and tantamount to scaremongering. 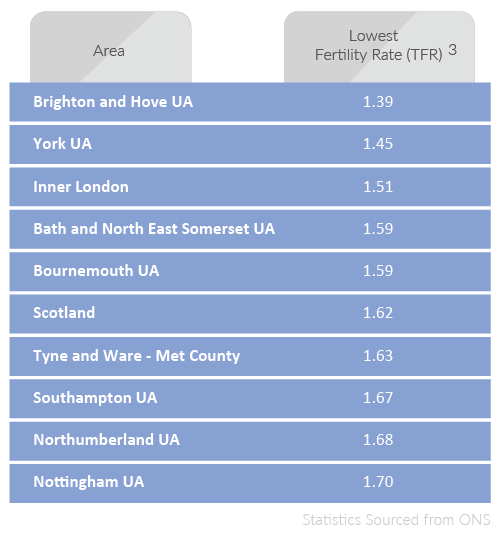 Realistically, the differences in fertility are likely to lie in lifestyle choices and even property prices. With a London flat averaging a monumental £492,707 (rightmove.co.uk), and a terraced property fetching £633,746 (rightmove.co.uk), those looking to move to a larger property may find it hard to finance such price tags, and may even opt to move elsewhere. Cambridge’s average price tag similarly worked out at £496,730. Whereas, the average Oldham house price was a meagre £120,765 (rightmove.co.uk), and £119,039 (rightmove.co.uk), for a house in Bradford. Cheaper living is often important to families owing to the sheer cost it can take to raise a child.